I'll be having an 8 am class tomorrow! The earliest class i ever had after more than 6 months already! I wonder how will i get up. Perhaps i will ask the fogging uncle to do what he did today. Fog the entire hostel when most of the residents are still lying in bed! I wonder why do they fog anyway. 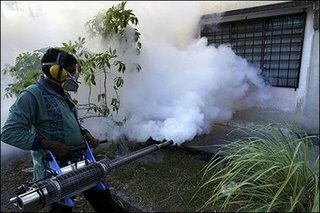 From what i heard the chemicals used will not kill the mosquitoes but will only cause mutations and the result will be super-mosquitoes. You know, the type of mosquitoes that do not die even if you slap them between your palms and can lift up things weighting more than 120 pounds? Just kidding. But yeah, from what i see, the fogging in my hostel mainly serve a purpose of waking up the residents only. Because if we don't wake up, God knows if we ever will with all those white smoke blowing into your room. I wonder why they don't do it in the evening?